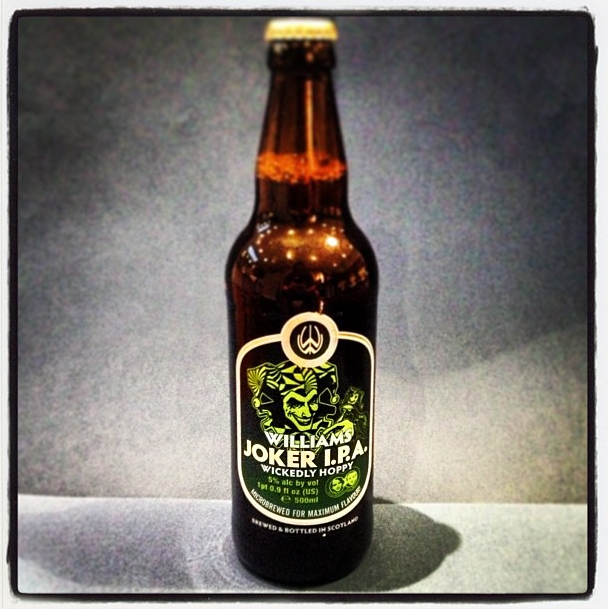 Williams Joker IPA is a lovely little mischievous beer. On pouring it has got a lovely dark lager looking body with plentiful fizz and carbonation – giving off a loose and bubbly light head. The aromas are cheekily enticing – citrusy hoppiness with some fruity peachiness – all making me eager to crack on and get started.. Taste offers a lovely balance or bitterness and sweetness. It’s also got a lovely amount of hoppiness in there – certainly not overpowering – more subtle and just about spot on for me – there’s also some piney and peppery notes mingling in with those citrusy flavours. It’s one of those beers you want to roll across your tongue in non stop recurring sips – hoping the glass won’t end just yet – but because it’s so tempting it’s over far too quickly and annoyance sets in with the realisation that I only had the one bottle in the fridge! There’s at least one in every pack and this is our very own agent of chaos. Created from a complex layer of malts and blended hops, this well balanced IPA delivers satisfaction every time. Golden in the glass, fruity on the nose with hints of cedar. Joker IPA is Bitter/Sweet, full of flavour and is sure to put a smile on your face.